Humpback whale breach in Hawaii PC: Kohala Sail & Sea Michael Faughn An annual effort to monitor humpback whale migration numbers in Hawaii will proceed as scheduled despite the shutdown of the federal government, a spokesperson for the National Marine Sanctuary Foundation said Tuesday. Hawaii News Now. 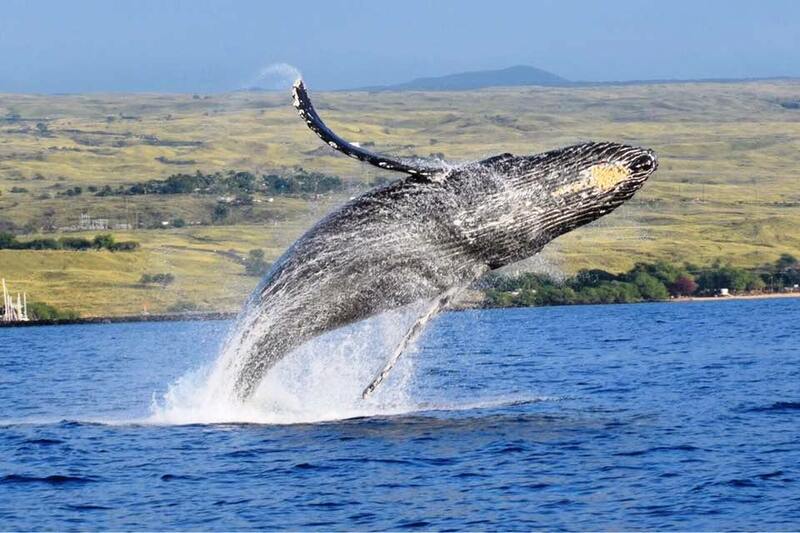 The Hawaiian Islands Humpback Whale National Marine Sanctuary's annual Ocean Count will take place January 26 despite the federal government shutdown. KHON2. Mike Gabbard joins other lawmakers from coastal states to oppose offshore drilling. Associated Press. New State Lawmakers and Their Priorities. There are 12 new state lawmakers for the upcoming session – 9 in the House and 3 in the Senate. Hawaii Public Radio. Gov. David Ige has chosen Jay Griffin to chair the Public Utilities Commission. Griffin has served on the three-member commission since May 2017. Star-Advertiser. Gov. Ige reappoints leaders for DOD, announces new appointees for 3 state departments. Two leaders at the helm of Hawaii’s Department of Defense are likely to continue their work after Gov. David Ige announced their reappointments to their positions Wednesday. Hawaii News Now. Shutdown leaves Hawaii immigrant cases in limbo. The impasse in Washington has raised fears in Hawaii funding will end for federal benefits used by low income residents, for food, housing and much needed assistance. KITV. Tensions rise between 2 of Hawaii’s Congressional leaders over ‘religious bigotry’ comments. Hawaii Congresswoman Tulsi Gabbard appears to have “called out” Hawaii Senator Mazie Hirono over her questioning of a judicial nominee, accusing her and others of religious bigotry. Hawaii News Now. The Navy test-fired a series of new hypervelocity projectiles this past summer from the destroyer USS Dewey during Rim of the Pacific exercises off Hawaii that the Congressional Research Service said could be a “game changer” for defending warships against an increasingly sophisticated array of Chinese missiles. Star-Advertiser. The Hawaii Supreme Court pressed election officials Tuesday for information on late-arriving absentee ballots in a dispute over Trevor Ozawa’s 22-vote victory in November for a seat on the Honolulu City Council. Star-Advertiser. Honolulu City Council candidate Tommy Waters says he is pleased that the Hawaii Supreme Court is asking more questions about how ballots were counted in his close race against incumbent Trevor Ozawa. Hawaii News Now. A place for Iwilei homeless to shower, do laundry, pick up mail and receive other services opened Tuesday on Kuwili Street. Star-Advertiser. After years of waiting, a hygiene center (and safe haven) opens in Iwilei. The rest stop is the first phase of a multi-million dollar project designed to help Iwilei’s homeless population. Hawaii News Now. The homeless in Iwilei now have a place to shower, wash their clothes, and check their email. KITV. ‘Go home’: Councilman has choice words for a Chinese developer that threatened to boycott Hawaii. It comes as the developer appears to have broken a key promise. A Chinese developer’s promise to hire hundreds of local, unionized construction workers at his Sheridan Street condo project appears to be in jeopardy. Hawaii News Now. Hawaiian Airlines revises international check-in site for some passengers. Star-Advertiser. Kealohas’ foreclosed Hawaii Kai home goes on market for $1.3M. The Hawaii Kai home of retired Honolulu police chief Louis Kealoha and his former city prosecutor wife, Katherine, is for sale while their lender forecloses on the property and the couple faces corruption-related charges. Associated Press. Jim Nabors’ oceanfront Honolulu estate sells for $12M. Los Angeles Times. Tarballs found in sands at Spencer Beach Park in South Kohala. West Hawaii Today. Squatters, homeless, vacation rentals, taxes and an emergency relief package in the wake of last year’s volcanic eruption top the priority list Mayor Harry Kim is presenting to the state Legislature this year. West Hawaii Today. Joining The Parade Of Counties That Are Raising Taxes. Hawaii County tacks a 0.25 percent surcharge onto the general excise tax and considers going higher. Civil Beat. Courts and corrections officials modified their operations after an accused murderer was mistakenly released from the Hilo jail last summer, and the Hawaii island courts now send bail documents to the jail via email as well as having them hand-carried to the facility, state lawmakers were told Tuesday. Star-Advertiser. County officials shot down a bill that would require the county to establish a plan to control feral animals and waste at county facilities. Tribune-Herald. Suit against Big Island Dairy settled. The suit was filed in 2017 in U.S. District Court in Honolulu by citizen group Kupale Ookala and the Center for Food Safety and was scheduled to go to trial this month. Tribune-Herald. Big Island Dairy Settlement Sets Dates For Closure, Cleanup. Big Island Video News. The deadline for applications for Maui County boards, councils, commissions and committees has been extended to Jan. 15. Maui News. 1.2 acres in Kapalua set to be preserved as open space. A conservation easement for a 1.2-acre property in Kapalua that includes a trail in the area has been donated to the Hawaiian Islands Land Trust by the Sue D. Cooley Trust. Maui News. Maui housing prices rose last year to a record for single-­family homes but still lagged a more than decade-­old high for condominiums despite a double-digit rise. Star-Advertiser. Developer's plan for second Maui hotel triggers need for EIS. R.D. Olson Development’s plan to build a second limited-service hotel on Maui outlined in an environmental assessment last summer has triggered a requirement to prepare a more detailed environmental impact statement. Pacific Business News. Kauai Fire Department Chief Robert Westerman is retiring before the end of the week, but the fire commission has not decided who his successor will be. Garden Island. The Kauai Fire Commission is searching for a new fire chief, following the retirement of Chief Robert Westerman after 20 years of service. KHON2. Kauai reaches goal of 50% renewable power. AES Corp. has completed a solar power plant on Kauai that can do something most renewable projects can’t: deliver power when it’s most needed. Star-Advertiser. A 150-acre solar farm on the south side of the island was unveiled Tuesday. Garden Island. New solar-plus-storage facility gets KIUC past 50% renewable generation. Kauai Island Utility Cooperative has reached the next milestone in its pursuit of 100 percent renewable energy generation with the completion of the largest solar-plus-storage facility in the state. Pacific Business News. Kauai home sales increase in 2018, prices rise 6%. Single-family home sales rose 8.17 percent in 2018 to 596 houses sold, from 551 houses sold in 2017. The median price of those homes was $699,500, which was a 5.98 percent increase from $660,000 in 2017. Pacific Business News.